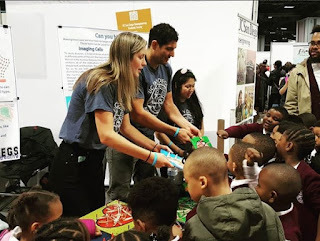 Engineering Festival in Washington, D.C. 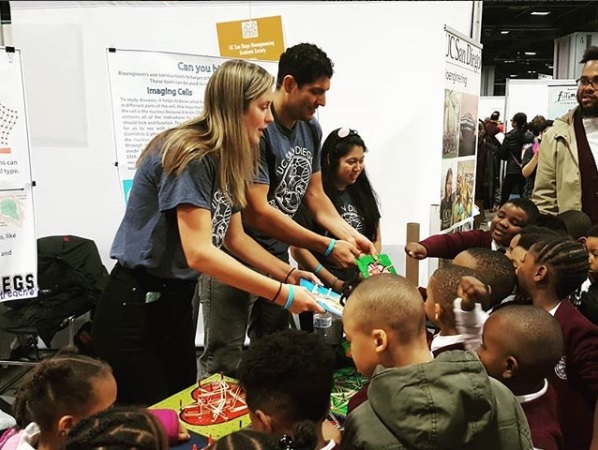 In early April, Washington, D.C. is flooded with science exhibitors, enthusiastic parents, children, and all things science and engineering at the annual United States of America Science and Engineering Festival (USASEF), which drew an estimated 370,000 visitors this year. USASEF is put on by Science Spark, a non-profit science outreach organization that also hosts the San Diego Festival of Science and Engineering; the festival is sponsored by organizations such as Lockheed Martin, the Department of Defense’s STEM program, NASA, the U.S. Air Force, the National Institutes of Health, the National Science Foundation and more. This year, eight members from the UC San Diego Bioengineering Graduate Society (BEGS) and four members from the undergraduate Biomedical Engineering Society (BMES) flew to D.C. to engage the next generation of scientists and engineers with their model of an extracellular matrix, and learn more about science and engineering outreach on a national scale. 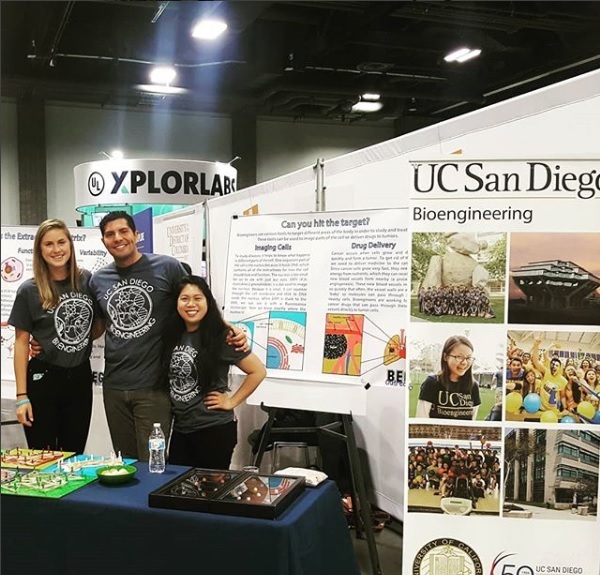 The following are excerpts from interviews done with Jacobs School of Engineering undergraduates Julie Yip, Taylor Martin, Reo Yoo and Katherine Nguyen, and BEGS outreach vice president Julia Hardy. They’ve been lightly edited for length and clarity. Q: How did you get interested in outreach? Julia Hardy: It was pretty natural for me, I couldn't imagine not doing it. I was involved in a lot of community service work and I got into engineering at the University of Illinois, Urbana-Champaign. I saw in high school how I was treated when I said I was going to go into engineering and I saw this confused look on peoples’ faces. They see this athlete who's outgoing, going into engineering and think, ‘Why would you want to do that?’ I knew I wanted to do engineering since I was in seventh grade. Why wouldn't I want to do that? I knew that by talking about it I could encourage other girls in my grade and girls younger than me that I mentored in high school to go into engineering. I wanted to continue spreading that word and show girls that they could do whatever they want, especially engineering because they may feel it's not cool to be into science and engineering. What did you expect going in to the USASEF trip, and what was it like in reality? Taylor Martin: The BEGS president told me it was going to be big. I was like okay, it's going to be bigger than SDFSE. Katherine Nguyen: That was an understatement. Taylor Martin: It was huge. There was a flight simulator - you could put 10 people in this little pod and it would move around to simulate an army aircraft. There were multiple convention rooms. Reo Yoo: Because of how the convention center was setup, there was even an underground component. Katherine: There was an upstairs too. Taylor: You'd see at the start of every day this mess of people coming down the escalator. The other thing I hadn't really thought about was the diversity of booths. There were Army, Navy and defense booths plus engineering companies, university labs— so many different things. Katherine: All these things were really enjoyable. USASEF is mostly geared toward children, but because of how big the scale was they were able to accommodate for a lot of people. Johns Hopkins University brought a motor so that you could build your own battery motor. It was really fun for college students and parents to go enjoy science as well. Reo: For me, it really changed the perspective of SDFSE. I feel like when we go as UCSD, we're such a big deal in San Diego. When we went to USASEF, we were this tiny booth— we got some foot traffic, but there was so much more. Julie Yip: I had a good conversation with a sophomore in high school. She was really interested in organic chemistry and liked programming and said that she wanted more experience programming. I talked to her for about half an hour to forty-five minutes just about what she could do to get more experience, trying to motivate her and talking to her. She was cool and passionate. Katherine Nguyen: There are so many stories about how cute or smart they are. This group of girls asked us some good questions. I asked them if they were really interested in science. And they said 'Oh yeah, we have our own booth where we show experiments to people.’ This was a group of three sisters, the oldest was maybe 13, the second was around 10, the third around 8. I was blown away. Taylor Martin: Their mom was there and they had shirts. That was so cool. These girls had taken so much interest in science and were willing to do something that I would have been terrified to do at that age, acting as an authority at this big giant festival. They were so confident and involved. Reo Yoo: It’s nerve-wracking. It’s not just kids there. There are professors and doctors who are there to present. Julia Hardy: My favorite experience at the festival itself was a group of around 15 six-year olds that came to our booth. They were like ’Science!’ They were so excited about science. One kid was crying that he couldn't touch our demo. He was so sad that he couldn't interact with the demo, since there were too many people in front of it. So we passed it around and he finally got to touch it. It was the little kids that get so excited. That’s what we need to nurture. Give kids the world and they'll do amazing things with it.